The reason Paul and his companions had to land at Puteoli was because it was the main harbor of Rome at that time. Although Rome sits on the Tiber River, the mouth of that river had become silted and shallow, so it was not a suitable harbor for the large ships transporting grain and other goods to the capital city. Nevertheless, the city of Ostia sat at the mouth of the Tiber River for many centuries before the time of Paul. The idea of dredging the mouth of the Tiber to make the harbor functional was first thought of at least as far back as the time of Julius Caesar in the mid-first century B.C. But the plan was not executed until much later, under the reign of Claudius in the mid-first century A.D., about the time Paul was traveling to Rome. 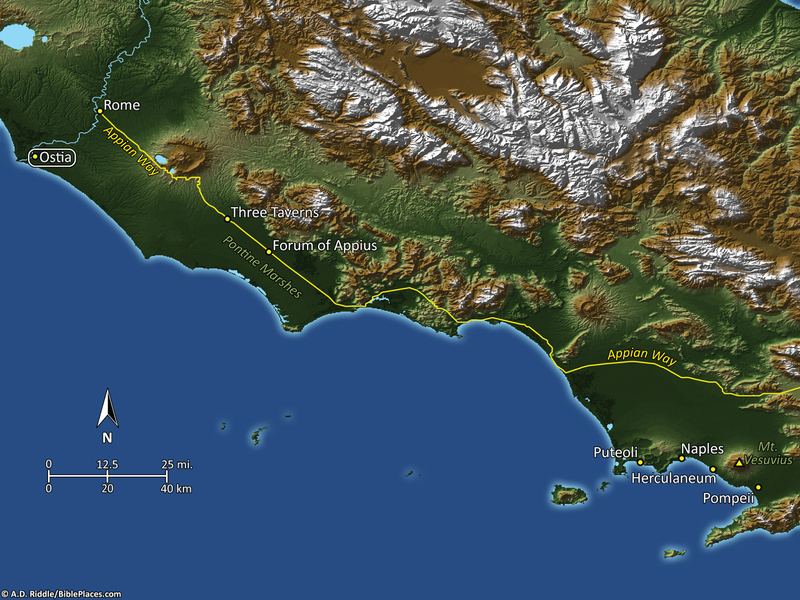 As you can see from the map above, the opening of a harbor near the city of Ostia greatly increased the efficiency of transporting goods to Rome by allowing the product to be delivered by boat only a short distance from Rome instead of having to be dragged 150 miles across a significant portion of the Italian peninsula. (Ostia is located in the upper left section of the image and Puteoli is located in the lower right section. Click on the image to enlarge it.) Naturally this was a boost for the city of Ostia, but eventually led to the demise of Puteoli. 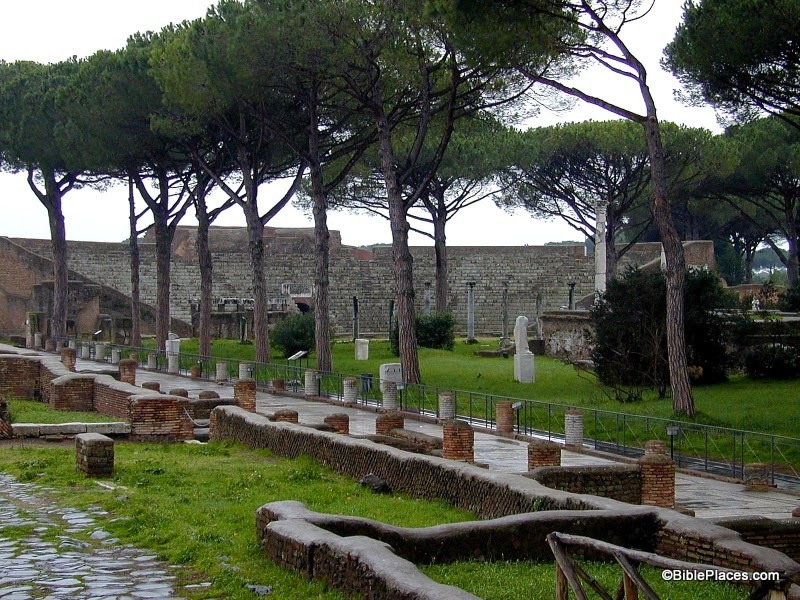 The image above shows the square of the guilds in Ostia with the city's theater in the background. As a major habor city, Ostia was home to several trade guilds. In this area there were 70 guild offices, many with a mosaic floor identifying which guild used the space. The customs officials also had their offices here. The Harper's Bible Dictionary lists the following imports that flowed through Ostia: "grain, fruits, fish, meat, hides, oil, wine, minerals, jewelry, lumber, glass, paper, dyes, clothing, spices, ointment, and perfumes." The first century city also included a large government building, a temple to Augustus, a gymnasium, a bathhouse with impressive mosaic floors, a public latrine, and a synagogue ... all of which are included in Volume 15 of the Pictorial Library of Bible Lands. A Decumanus about 1,200 meters long (3,840 feet) cut through the city. About two thirds of the city has been excavated, and a visit to the site today can give you a good feel for what it was like to live in a Roman city. Many scholars believe that Paul was eventually released from captivity in Rome and left the capital to continue his mission of planting churches across the western Roman empire. On his journey away from Rome, it is possible that Paul passed through Ostia, however Ostia is not specifically mentioned in the Bible. So although Ostia was a significant city in its heyday, many students of the Bible have never heard of it and it consequently finds itself on our list of "obscure sites in the PLBL." This concludes our series on "obscure sites in the PLBL." The last three volumes of the collection focus on trees, plants, and flowers of the Holy Land; cultural images of the Holy Land; and signs of the Holy Land. These are excellent collections and highly recommended, but unfortunately they don't fit in a series that focuses on obscure places. On a personal note, I will be taking a break from our "Picture of the Week" series to focus on some other projects for a while. It has been over a year and a half since I started this series. (For those who may be interested, the first post of the series can be found here.) Over that time, I hope I have done justice to the extraordinary qualities of the various collections that have been compiled and edited by Todd Bolen. In a series of blog posts, it is impossible to capture all the fascinating items that are included in the Pictorial Library and Historic Views collections, but hopefully I have given you a taste of what you can find in these works ... and whet your appetite for more. The photograph and map above are included in Volume 15 of the Pictorial Library of Bible Lands, which is available here for $24 (with free shipping). The excerpt is taken from "Ostia," in Harper’s Bible Dictionary, edited by Paul J. Achtemeier, Logos Edition (San Francisco: Harper & Row, 1985). For other posts in our series on "obscure sites in the PLBL," see here. Seth - thank you for your excellent posts. You've done a terrific job of enlightening us, and always in an enjoyable way. May the Lord bless you this year as you devote yourself to other endeavors. A.D. - thank you for creating the maps to accompany this series. They are always beautiful and accurate! I look forward to the day when a collection of them is available. I, too, have been enriched by this series. I have the entire series at my fingertips but your highlight of little known places within it has brought them to the forefront and whets my appetite to delve deeper into it.